A shocking video of small children – dazed and covered in blood – has revealed the grim truth of Thursday’s bus attack in northern Yemen which left 50 people dead. The bus was in the Dahyan Market in northern Saada, a Houthi rebel stronghold, when it was attacked on Thursday morning. The International Committee of the Red Cross confirmed the attack shortly afterwards, as it was inundated with injured children – many aged under 10 years. A Ruptly crew has filmed the injured in hospital. WARNING: Following video contains disturbing images. In the video, a shocked-looking child has his backpack removed by a hospital worker as doctors prepare to assess him. The small child sits covered in blood as others are wheeled into the already swamped medical center around him. 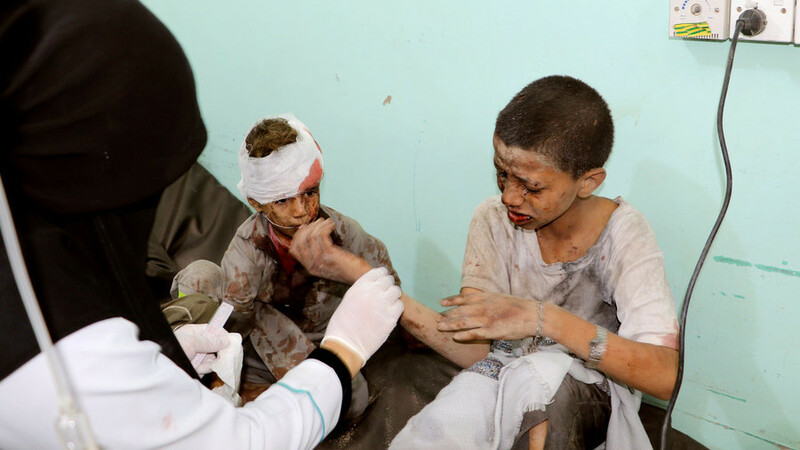 Blurred by video editors, the footage also shows the lethal reality for some – the broken bodies of Yemeni children who were killed in the airstrike that took out their bus. Many passengers on the bus were school children.